I don’t have time to post much this morning, but I wanted to get this out. 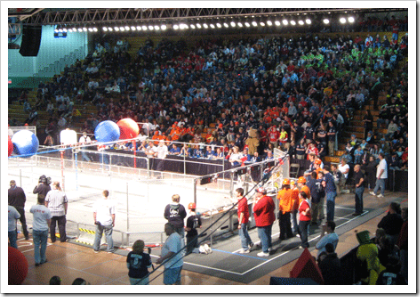 This Saturday (March 22, 2008) we attended the West Michigan FIRST Robotics Regional Competition over the weekend. I’ll post a couple pictures, and my first YouTube video (from my digital camera – came out pretty good). I’ll add some commentary and thoughts about it all very soon. We got to the competition with the preliminaries already underway. 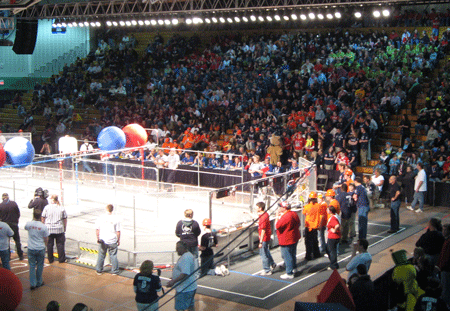 The rules are quite complex, but here is a link if you are interested. 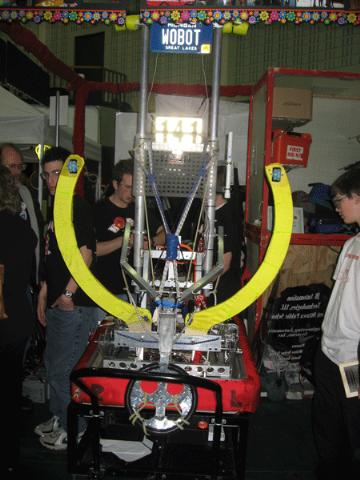 Then we visited the "pits" where many of the teams were willing to show us their robots close up (safety glasses please) and explain how they worked (and give out their team pin – which were cool to collect). 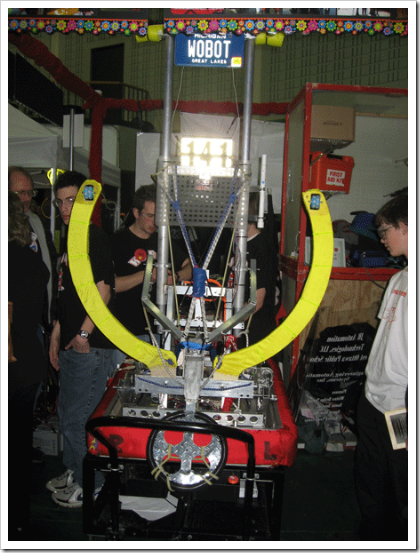 This is the "WO-Bot" from West Ottawa High School (near Holland) – this was Nathan’s favorite as it tossed the ball over the divide. I went through all the pictures and they really don’t give you a feel for what went on there. I added the YouTube video below to see if that would help. Lots of lessons and ideas came out of this day. More to come. Very cool!! Joe wants one now. I’ve been thinking what topic i place in my new blog or website. Other said that "robot" is good topic for me, and i ask why, he or she said that many people want to see the different styles of different robots. As a beginner i decided to search different robots and problems or error in creating a blog or website.